If you ask me, Game Day is all about the food. I’ve heard rumors that some people watch football for football’s sake. But to be honest, that’s not me. The challenge is that the best of football happens after the New Year. When recently made healthy-eating resolutions are still commitments worth sticking to. Which is why I’ve adapted some of my favorite snack foods to accommodate those of us still trying to make good food choices. So, put on the chili (we love this recipe! ), and set out some healthy-ish snacks to satisfy your football fans. 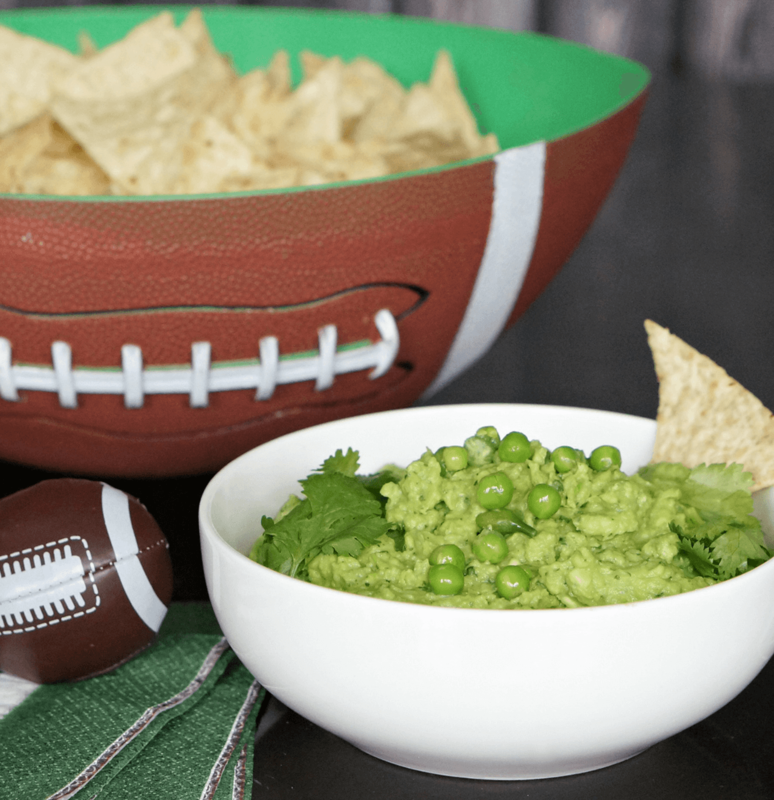 We’ve loaded up on Harris Teeter frozen veggies to flesh out our snack menu – from guacamole with a surprising star ingredient to Cauliflower Buffalo Bites that offer all the flavor and way less guilt, we hope you’ll find a recipe to cheer for… along with your team! Sweet Chili and Soy Sauce Glaze coat every Edamame pod for a finger-licking treat perfect for the big game! Cook edamame according to package directions and drain. In a skillet, heat soy sauce, chili sauce, mirin, and rice wine vinegar over medium heat. Cook, stirring often until a tight glaze forms – you want the skillet to be dry when you move the spatula on the bottom. This will take about 5 minutes. Add in the edamame and stir to coat. Continue cooking another 3-4 minutes, then pour into a serving dish. Sprinkle with sesame seeds if desired. Crunchy baked tater tots topped with all your favorite fixings. Easy. Delicious. Worth every bite! Cook the Tater Bites according to package directions. If you like them extra-crispy leave them in the oven an additional five minutes. Remove them from the oven and allow them to cool enough so you can handle them. Thread 8 Tater Bites on to each skewer and return to a baking sheet. Top with cheese and place the baking sheet in the oven. Cook for another 5 minutes, or until cheese has melted. Place skewers on a serving platter. Scoop sour cream into a plastic bag and snip off one corner. Drizzle sour cream on top and the drizzle on the sriracha. Top with bacon and scallions. Enjoy immediately! Don’t worry about your guac turning brown! Thanks to the addition of sweet peas that lend a vibrant green color, an extra dose of fiber, and a great flavor boost! Combine all ingredients in a food processor and pulse until you reach your desired texture. Taste for acidity, salt and pepper. Pour into a bowl and sprinkle with additional peas and cilantro if desired. Serve with Harris Teeter Organic Tortilla Chips and fresh veggie sticks. Love wing sauce but want to enjoy it without guilt? Swap out deep fried wings for these easy-to-make Cauliflower Buffalo Bites, perfect for game day snacking! Preheat oven to 425°F. Spray a baking pan with cooking spray and add frozen cauliflower to the pan. Roast for 15 minutes, flipping once. Remove the pan from the oven. In a large bowl, combine flour and water. Add the cauliflower to the bowl and toss to coat. Pour cauliflower mixture back into pan and roast, another 20 minutes, flipping half-way through. Remove the pan from the oven. Combine melted butter and wing sauce in a bowl. Gently add the cauliflower to the mixture. Toss and place each floret back onto the baking sheet, leaving any remaining sauce in the bowl and discard. Return the pan to the oven and cook for an additional 30 minutes, flipping half way through. Serve with your favorite ranch dipping sauce. Try the ranch dressing from our Slow Cooker Buffalo Chicken recipe for a dairy-free option.